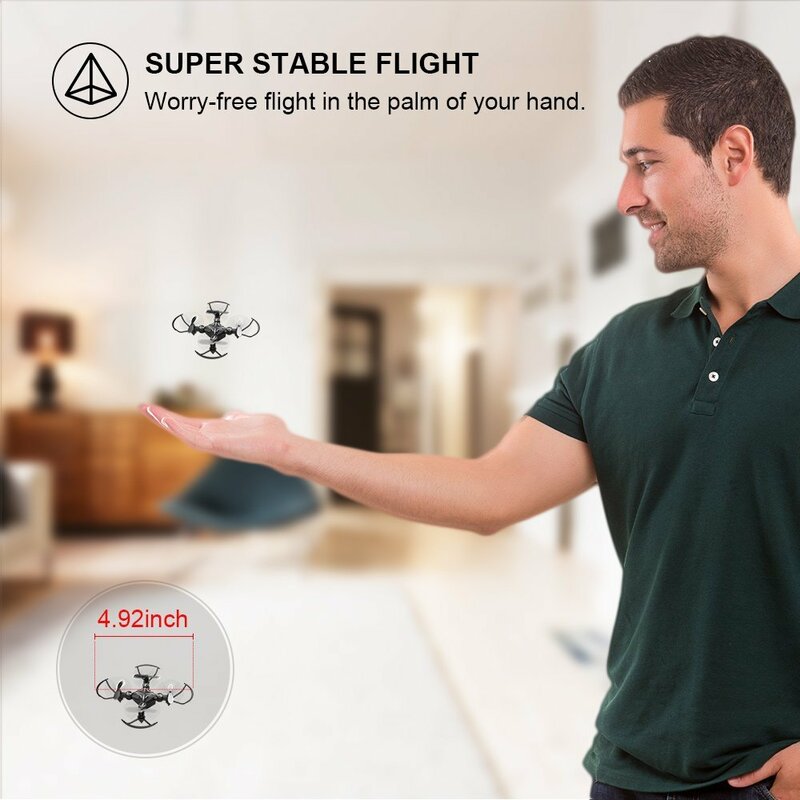 SUPER STABLE FLIGHT WITH ALTITUDE HOLD FUNCTION: The drone stays hovering at the desired height with this function; worry-free flight in the palm of your hand. Even beginners will have no problems at all and can immediately be good pilots! 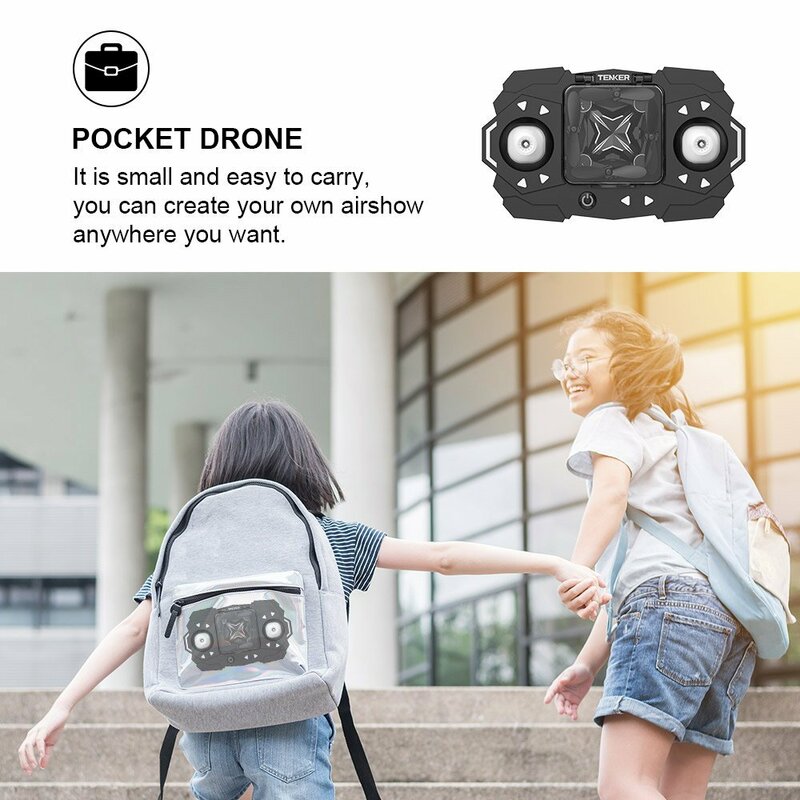 FOLDABLE AND EASY TO CARRY: This mini drone can be folded into the controller, which is small and easy to carry. You can create your own air show anywhere you like. DESIGNED FOR BEGINNERS OR KIDS, EVEN THE NOVICE CAN EASILY MASTER IT: One-key take off and landing, headless mode, EMERGENCY STOP, functional design, suitable for novice operation. 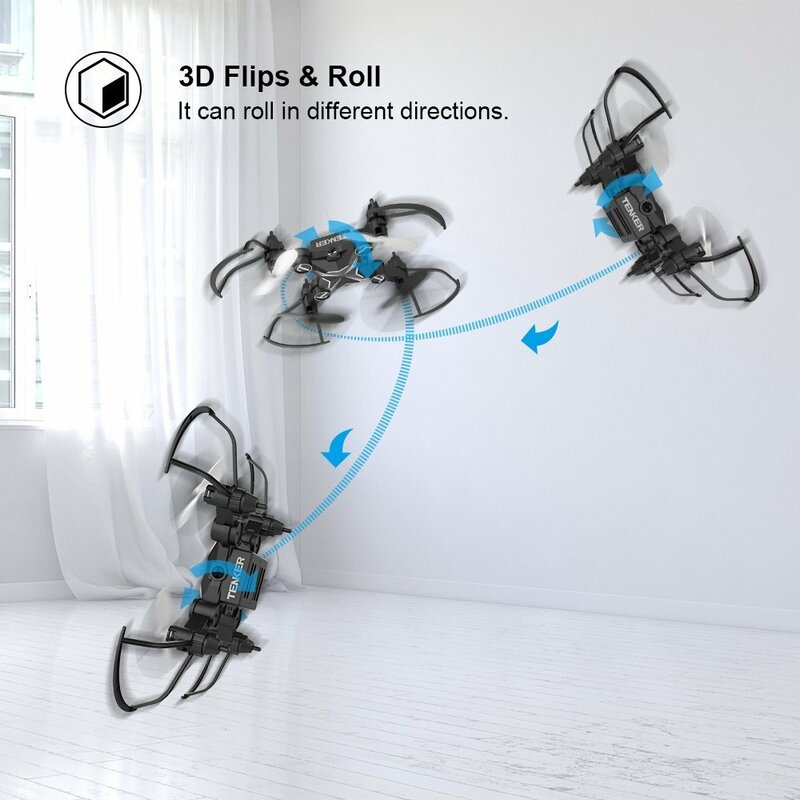 CIRCLE-FLYING/SELF-ROTATION FUNCTION: This cool circle flying feature makes flying this drone very exciting. It can fly a full 360° circle around a target at high speed. 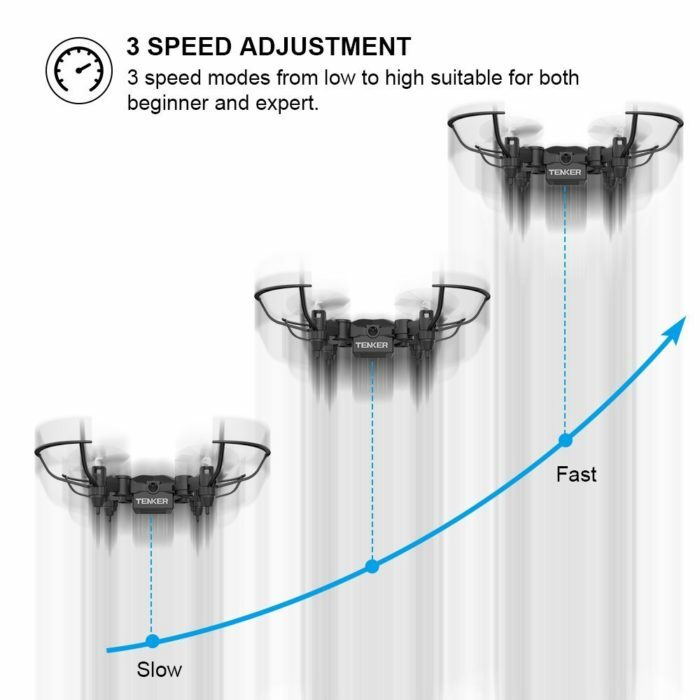 3-SPEED ADJUSTMENT: 3 speed modes from low to high make this drone suitable for both beginner and expert. Make sure the drone and controller are fully charged. Place the drone on flat ground. Turn on the drone then turn on the controller, move the left joy-stick up and down quickly to pair the drone until the light on the remote control turns solid, the light son the drone also turn solid. Now the drone is paired successfully. 1. Flyingerrors may happen after flights, a calibration and some trim work will fix theproblem. 2. Motorsmay heat up if being misused. Take a 5 minute break between flights to coolthem down. 3. The droneweight is less than 0.5lb, FAA registration is not required. Answer: It is a rechargeable battery for the drone. The remote requires 4 AAA batteries. Question: Does it come with a controller?? Question: does this drone have fpv? Answer: The 901H that I have does not have a camera. It has a bright light on the front of the drone that looks like a camera in the photo. Question: How do you calibrate the controller? I lost my manual. Question: How exactly do you do a “3D Roll” (manual is unclear)? Answer: I’d say 7-9 minutes in my experience. Was really happy about this drone. It stays level in the air and automatically turns off when it’s in trouble. Great for my kids to learn how to fly a drone. 5 stars for sure. I am always skeptical of Amazon reviews, so I am going to try to make this as honest and straightforward as possible. I bought one of these from Ebay, as I found a slightly better price. I definitely expected a cheap piece of junk, but I was pleasantly surprised. I’ll be putting my final thoughts at the bottom of the review I will come right out and say that this thing flies really well, and is extremely stable. It has a few features that really solve some issues I have with RC drones in general (from the perspective of a casual flyer). With any RC helicopter or drone, it does get annoying to constantly fiddle with the throttle to try to get a decent hover. The altitude hold works pretty much perfectly, and it’s built-in. You don’t have to press a toggle button or do any special actions to enable it. Give it throttle with the spring loaded throttle stick, and get it to a height that you like, then let the throttle return to the center position. The drone will hover at the altitude you raised it to. To bring it down, pull the throttle stick in the downward position to lower it to where you want it. This feature alone make it’s this thing a dream to fly. Auto take off: Works awesome. Press the auto take off button and the drone gently gets itself off the ground and hovers at about maybe 4 feet. It works great. Auto land: The auto land button works just as great. Press the auto land button and the drone makes a smooth descent straight down to the ground and shuts off. Headless mode: This also works great. But if you fly it behind you, after enabling headless mode, you’ll find that it will be confusing to fly. So you need to make sure that you enable headless mode while it’s in front of you, and only fly in light of sight in the direction you were facing when you enabled headless. Return button: People have said that this button just causes the drone to charge at you. It does appear to do this when you press the button. HOWEVER… I think the intent of this button is more for when you have the drone higher in the air, and further away. I have a feeling when you press the button, it will stay at the same height and proceed to you in a straight line, and stop when it is above you. I haven’t had a chance to test this, and I may come back and edit my review another time, after I’ve tested it. The GOOD news is…. if you press the button and the drone starts speeding toward you, all you have to do is press the right joystick in any direction to gain control again. Foldable design: Very cool but I wish the transmitter was designed to fit the drone in the storage space with the prop guards on. Build quality: The drone itself feels sturdy and well made. It doesn’t feel like cheap junk at all, which is exactly what I thought I was getting. The remote is very good too. The remote feels only a tad bit on the cheap side. But the joysticks work good and the trim and function buttons feel solid when you press them. Stability… did I mention the stability??? You do need to trim it sometimes mid flight, due to a little bit of drift. But I have that issue with every drone I fly, and I think it’s just the nature of drones. I do have an issue with the prop guards. It’s more with the fact that the drone doesn’t fit in the transmitter with the prop guards installed. The proper guards are great, and seem to be made of a durable plastic. But they are stiff to get on and off, which is fine.. you don’t want them falling off in mid flight. But since you can’t leave hem on if you’re going to store the drone in the transmitter, you have to install and uninstall the guards every time you use the drone. My issue with this is that, because of the tightness of the prop guards, it increases your chances of breaking something when you’re trying to get the guards installed. Even being careful, I have to put a good amount of pressure to get them on, and I just feel like if I slip one day or grab the wrong spot, I’m going to break something on the drone. It’s got a great build quality, but it just feels like you’re forced to handle in a bit of a grizzly way. Speed: The different speed settings are also awesome. The lowest speed setting is just perfect. It flies great in all of the speed settings, but that lowest setting is just awesome for getting used to the drone and when you want to fly more casually and gently. Most drones this size are very zippy and you are constantly making adjustments. Pros and Cons! PROS: Super stable Altitude hold works pretty much perfectly. This just absolutely makes the drone. Instead of constantly screwing with the throttle with little up and down movements to keep it steady, the drone does it for you, and you can concentrate on just flying it and having ufn. Auto land and take off also work perfectly. 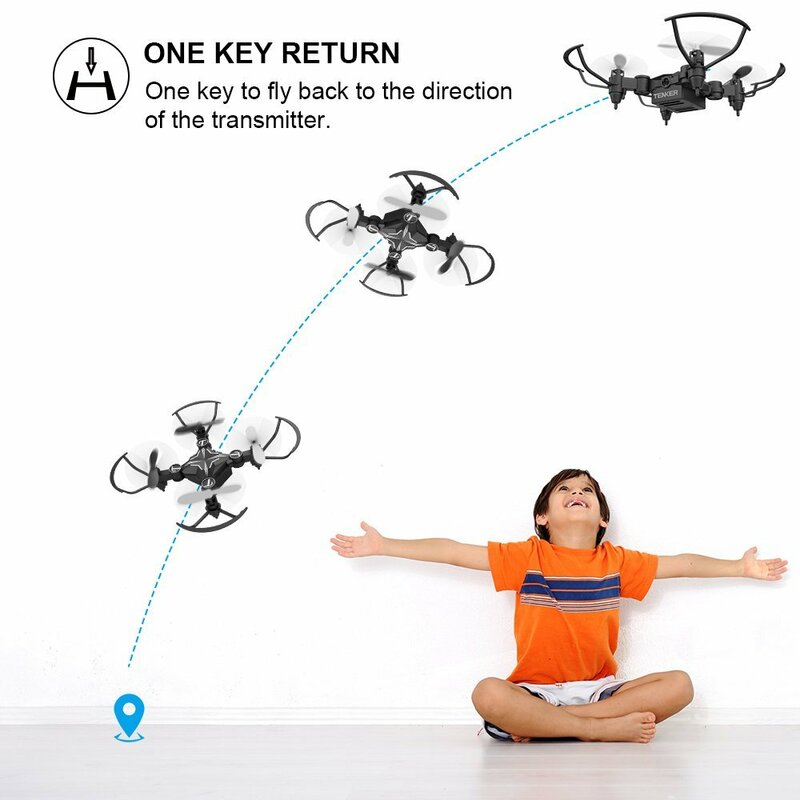 The drone is actually really easy to take off manually, but if you have a younger kid trying to use this, it’ll be great for them. stunts: Pressing the right joystick down (button press) allows you to perform stunts. These worked fine when I tried it, and they don’t require a huge amount of space. Flight time: It took maybe 40-something minutes (maybe an hour if I lost track of the time) and it flew for about 8 to 10 minutes. This is great and is totally enjoyable all the way through. Charges off the transmitter: This is a great feature and I haven’t seen it in a drone before. Many regular RC helicopters had this feature when regular helicopters were popular, but this is the only drone I’ve seen with the feature. CONS: The prop guards must be removed before putting the drone back into the storage space in the transmitter, and you’ll probably break something if you try to cram them in there. The internal battery is rated as not consumer replaceable Controller is a bit counter-intuitive. The buttons for all of the different functions are arrow buttons. There are no labels, and so the function buttons for auto take off, land, etc… they all look like the trim buttons. So you need to memorize them. FINAL FINAL THOUGHT: This thing is just absolutely awesome. I am really not that great at flying drones. Usually with the 4th channel added, I started to get more confused with trying to reverse the left/right controls when the drone faces a different direction. I found that because this thing is so easy to fly, I don’t find myself struggling with that so much. The lowest speed setting makes it so that if I do press the wrong direction, it doesn’t throw the drone off much and it doesn’t take much to correct my mistake. All of the smart features work great. Because it actually seems to be designed really well, that leads me to believe that the return button is probably intended to be used the way I mentioned earlier in the review. The charge time isn’t bad and the flight time is definitely good for a drone. You can charge it out in the field for multiple flights. I love this thing and plan on keeping it in my fleet permanently. An updated model would be near perfection if they just make the internal battery replaceable, give the controller more room for the prop guards, and maybe improve the controller layout. I do have to say one last thing. It looks like the internal battery might be replaceable. You can see it from the bottom, and it looks like it might be a standard battery. But I can see inside the drone to tell if it’s soldered to the board, or using a connector. For $25, this thing is stellar! Wow, this review was wayyy longer than I expected. Hope this helps! You won’t regret buying this. I bought this for my son who is 6. Within minutes he got the hang of flying it. It’s really fun and easy to get it. It’s not like one of those things you buy and it breaks the first day you have it. Great product, very durable. My son has crashed it a few times. We recalibrated it and it works perfect. It has an automated shut off feature that prevents anything from happening to the motor. I would definitely recommend you give this a shot for first time drone users. Grand daughter loved getting this and had no problem getting it up and running. Her excitement dimmed somewhat when she lost track of it and it ended up caught in her hair. Gotta love kids! Got this drone today for my son. I couldn’t get it to work after spending an hour syncing the drone to the remote controller. Very frustrating. Update 8/16/18: Drone synced right out of the box once replacement arrived. My son couldn’t be happier. Thanks to Tenker excellent customer service. It takes a little while to get used to flying this mini drone but sure is full of fun. This is a great little starter drone. I’m able to easily maneuver it around our small living room. The auto launch and landing features are very useful. This thing is awesome!! I was expecting a dumbed down control similar to the cheap remote control helicopters out there. Nope. This thing is the real deal! I couldn’t help but grin ear to ear when I figured out how to do the flips and rolls. Ordering another one ASAP! Great toy, my sun loves it. One of engines stopped working shortly but seller replaced the malfunctioned item in a very timely manner. I never knew you could have so much fun with a little drone. It is insanely quick and nimble. It is really finnicky setting up for the first time, but after you get it paired, it works flawlessly. Survives abuse and easy to fly! I’ve never flown a drone. I was able to have it flying in 5 minutes. I fly it in the house exclusively and have crashed it multiple times flying it with my 5 year old daughter. She can fly it alone but is very cautious. Hair got stuck in the motors once and I thought the motor got toasted from trying to take off with blockage but I tweezed the hair out and it recovered. I’ve used the extra propellers now and bought another one when I was unsure if I could save this one for my daughter. Survives the damage and with a little recalibration with the controller it is good to go again. I somehow got the original on a deal for $11 but I think it’s still a deal at $20. Fun little Micro-Drone. PERFECT FOR BEGINNERS AND fun for Experienced Flyers!!! Has a decent range, battery life is pretty good (aprox 8min). I had to make mini labels for all the function buttons since I couldn’t memorize them. Mine came with prop guards which is handy for indoors and it also came with a charging cord attached to the remote so I could use the remote to charge the Drone also, though I don’t see that here. Hmmm.. Outdoor flight is fun, but can’t take any wind over 1-2 mph, range is good as I got mine out to about 100ft away and 50ft up before I got nervous and brought it back (it was hard to see to, lol). I bought it to train for a bigger drone I was buying and now keep it for friends that want to fly my bigger and much more expensive Intermediate Level Drone (Contixo F18). Saves me from getting nervous watching someone trying to learn how to fly with my more expensive Drone. Can’t wait until I’m a good enough pilot to get an advanced Drone to take awesome videos. It flies really well but it’s a pain to have to sync it every time. Had minor difficulty learning to start it up but after figuring that out it is a blast to fly. I used it learn orientation of flying drones which helped me fly my larger DJI drone. Just be careful flying in wind outside. Very easier to control after you get usually to it. The only down side is that the charging port is very hard to connecting. Awesome Product!!!! This thing has taken some pretty hard crashes and still fly’s perfect! Way easier and more fun to fly than my several hundred dollar drone!! Bought this for my Grandson. Has been a great purchase for him and he is really enjoying this drone. I would recommend this for a young person. He has gotten very good at flying and doing the tricks its capable of doing. Very fun and easy to fly! One of the best indoor flyers imho. The altitude hold works like a charm and it looks so awesome when it does flips. Battery also last a long time. Only complain is that I lost my USB charger so I can’t charge it anymore using wall charger. 4 stars only because it can’t be used outside. This mini drone is really great! It is easy to control and fly’s nice! The charger is annoying, but other than that it’s all fun! This is the perfect beginner quad! On top of it’s obvious portability and it’s charge cable right on the transmitter (Only use it when you don’t have access to ac power btw), it is super easy to fly! Whenever a guest or a family member sees me fly any of my other micro drones, like the JJRC H36, inevitably they want to give it a shot. If it’s a person’s first time something like the H36 may turn them off….not with this little guy. It has all the features to get a first timer hooked; altitude hold, auto take off and landing, prop guards, has really tight easy flips (I am a huge fan of the flip function being on the right stick, makes the flips seem more intuitive), it has a yaw spin and a pretty cool orbit setting, and three different rates. Speaking of rates, for the experienced pilot, the third rate is powerful enough to fly in light breezes, and indoors can give the stock H36 a run for it’s money. This is an easy pick for a first timer, or for someone more experienced who just wants to have fun. The only drawback I see is that it has a permanent battery…. I have opened it up and it looks to be a standard 1s 3.7v 150mah battery that is soldered directly to the board, an adventurous person could easily mod this thing to make the battery swappable…..oh yeah and like other non GPS quads, the return to home feature is useless (I really wish they wouldn’t add that feature to toys like this, it just makes people think there quad is broken). 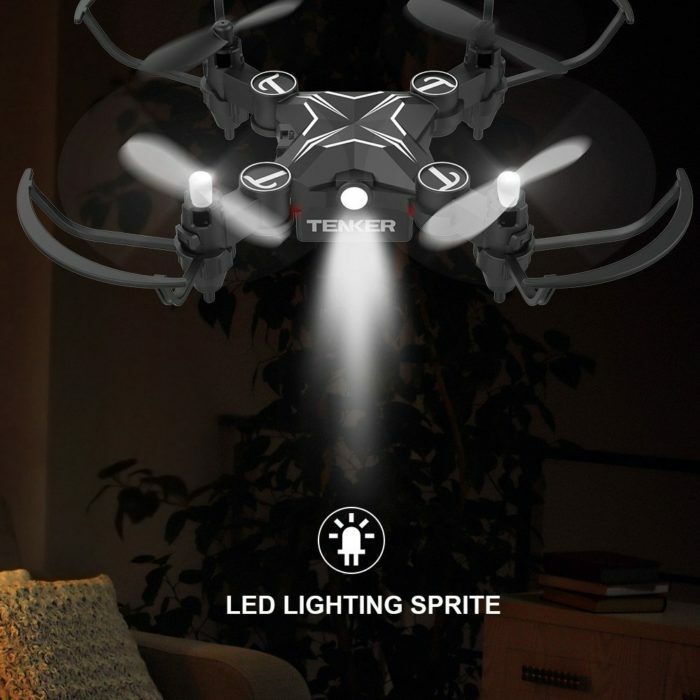 Also there looks to be another version of this drone distributed by Rabing that does wifi FPV, it’s ten dollars more, but I wouldn’t recommend that one for a first timer because the LED light on the front is swapped for the camera….and that LED light is very important for a first timer learning orientation. Overall you can’t go wrong with this little guy, my son learned on this one and quickly graduated up to larger and more advanced quads….but this guy still gets fired up almost daily! Happy flying! Awesome little toy! Finally got to play with it after i bought it over a month ago! This drone is very easy to fly. It has a self land and can do flips at a touch of a button. We primarily fly it in the house. Easy enough for our 6 year old to fly! This little drode is so much fun to fly. Plus it can take a beating when you fly into the wall lol. Great little drone. It’s amazing how many features it has (headless, auto land/takeoff, return to me, 3 different speed levels, tricks, etc.,) for how small it is. I will admit, though, the instructions are AWFUL- so bad that we could not get it to work using them and had to experiment on our own. To clarify the instructions: 1: Turn drone on and set it down 2: Turn controller on 3: Turn both joysticks diagonally to the bottom inside – should hear a beep (then wait for it to stop flashing) 4: Turn both joysticks diagonally to the bottom outside – should hear a beep 5: Blades should start spinning, it is at that point that you must begin to fly it. If you wait for them to stop you will have to repeat steps 3 and 4. NOTE* When the drone is low on battery it won’t fly. You will know it’s low on battery when the drone’s lights flash every second. Easy to set up and fun to fly!! This is a great drone for the price. If you are having issue with the USB charger, get a pencil and a rubber band and tie the rubber band to the Charger. Then place the charger and rubber band around the drone and place the pencil through it to pull tight. Now it charges. See pic. this is nice，i purchased it couple weeks ago, and just opened it last weekend. The package is nice and looks worth it. My son played it and he really like it. This is a fun little drone that has more features than some bigger drones. It was very easy to fly. It a staple drone for in door fun. It is a good trainer for kids to flight drone. The only draw back is to memorize all the button for many features. The flight time was like 8 min, but I wish they had the option to swap out the battery for more fun. Great beginner Drone. Definitely worth the bang for your buck. Just out of the box and I’m flying my son’s mini Drone like a pro! Yes, my sons lol. 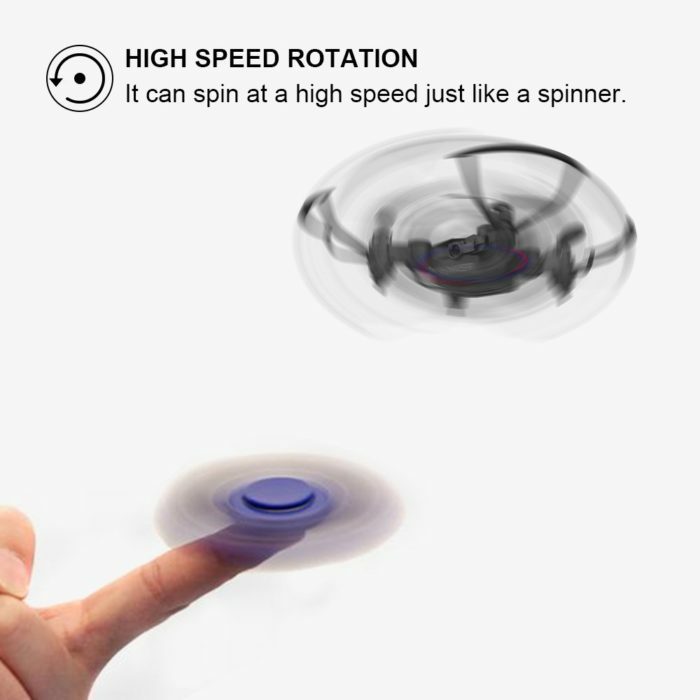 It controls smoothly and actually hovers within a 8 inch radius once fine tuned. I was skeptical at first since I had another brands inexpensive Drone that I had no control over and basically just flew into walls/ceilings but this one is the real deal. It flys where you want it to go with ease. I’m having a bit of a tough time setting the headless mode. That mode is new to me but from my understanding it should fly the Drone front/back/left/right based on where you are regardless of the drones axis. Since I’m on a learning curve I’ll have to double back on that one. Edit:After playing with it a bit more, I found Headless Mode more accurate by activating the setting then re-calibrating (joysticks diagnol/down towards eachother) the Drone before flying. Bummed I missed the $5 off coupon by a couple days but hey, that’s not the company’s fault. I own several Syma and Cheerson CX-10 mini quads. They’re all fun to fly. This was an impulse buy because of a low price. I’m impressed. This is the most controllable quad I’ve ever had. The take off and landing features work well. The headless mode makes it easier to fly for beginners. The trim controls work well and the auto altitude works. This is great to fly. I only fly it indoors. I will have to go outside to try the circle mode. Overall a lot of fun. Nice build quality and neat packaging. I use the USB cable to charge it. It takes about an hour to charge. Nice. The quadcopter itself is decent. My daughter figured out how to fly it relatively easily, but the instructions are translated from a foreign language with questionable grammar, spelling, and clarity. If you have other flyers, you’ll probably find your way to flying it, but if you are a beginner, expect some confusion with the instructions. That being said, the customer service section was keen to see that we were happy with the product. If you have $30, it’s a decent starter quadcopter with the security that problems or mishaps will not break the bank. Awesome little drone! It takes a little bit of getting used to, but not long. I bought it for my son who just turned 9 and he loves it. 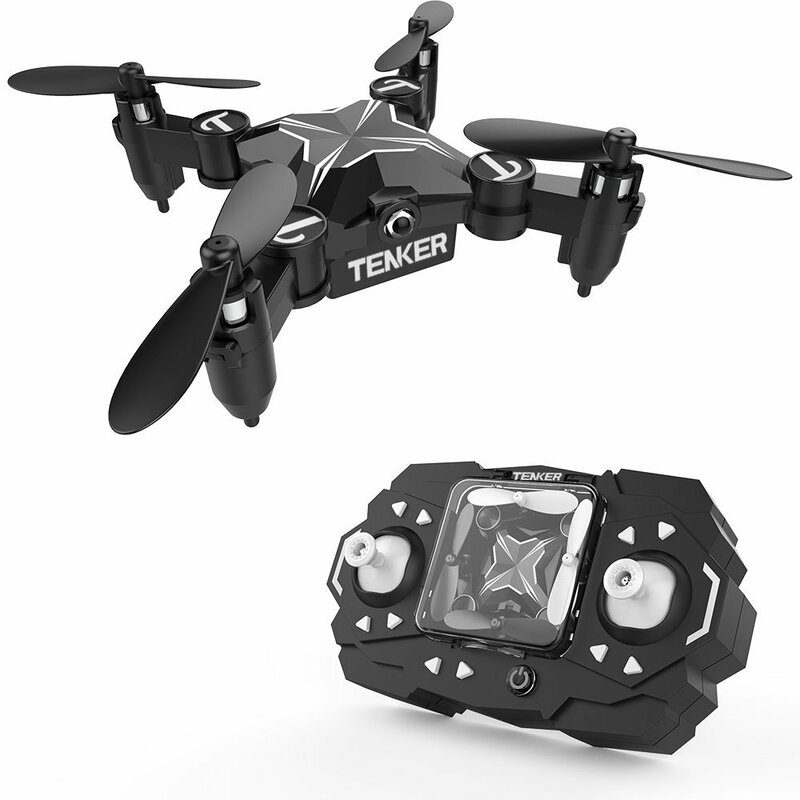 Perfect starter drone, especially at this price! REALLY smooth, well built and well balanced. The battery life is very short, but that’s typical in those tiny drones. Thanks a lot! This is my fourth quadcopter. This little gadget is really fun to fly, especially indoors. When I can’t fly outside because of flying conditions or my schedule, this little drone allows me to get it out of my system and even do some fun stuff that I can’t do with my larger drone. Overall, I really like this drone. 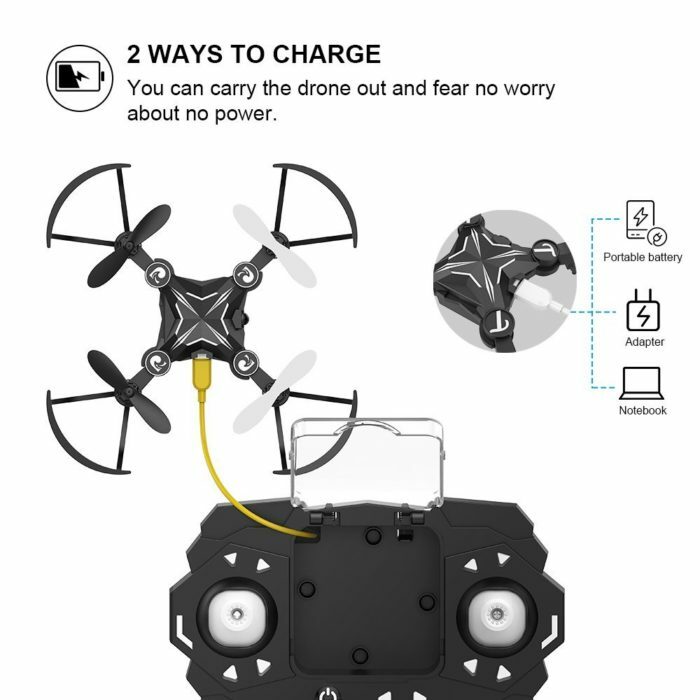 The folding format and storage inside the controller is awesome along with the ability to charge the drone up using the controller as a power source. It has the aerobatic flips and a spin which adds a real fun dimension to the flying experience. Altitude hold is great as is one-key take-off and one-key landing. With that said, I do have a few observations that explain why this is a four- rather than five-star rating. First, I find that I really have to trim heavily on initial takeoff to get the drone relatively stable. Note: I am not flying in an area where ceiling fans or similar conditions would disturb the stability of the drone. Next, the one-key return results were not good. The drone should have come back in the direction of the transmitter. However, it veered off to the right and crashed into a wall — after which I decided not to try that feature again. For that reason among others, it is a good idea to install the pro guards if flying indoors. I am also concerned that I hear the prop/motor changing to a higher pitch whine intermittently then quieting down again. This happens even though the drone is not getting heavy throttle or pitch/roll. In the category of “minor” but would make the buyer experience better are these: The instructions in the manual are incorrect in a couple of areas. This may be due to the manual being written in a generic form to accommodate other drones where the instructions may apply. I have no idea — just speculating. However, the steps in the manual for binding (syncing) the drone and the controller are different from what is actually required. They call for up/down movement of the throttle. Actually, turning on the drone first then turning on the controller (must be in that order) will automatically bind the drone. The transmitter will “beep” once, the lights will flash, then go solid at which point the binding process is complete. Note: Calibration steps as documented must still be completed. Also, there is no blue light (charging / red light (charging complete) sequence. The red light is on while drone is charging and off when charging is complete. The last observation is with the controller itself. It did not take much time to memorize the various buttons by their location and function but having them labeled on the controller would be very helpful, especially for novice drone operators. Still, this is one of my favorite Micro/Nano drones. If you are looking for a good indoor flyer, a nice, easy drone for beginners, or just want kill some time and have fun, this drone is an excellent choice.